Summer produce is at its peak this week. We have tomatoes coming out of our ears (no complaints). My counter is filled with heirloom tomatoes, other field tomatoes and bowls of cherry tomatoes. I know it’s fleeting so I’m trying to consume my fill of tomatoes while they last. I’ve been slicing lots of tomatoes for topping toast, sandwiches, bagels, or anything else appropriate. I’ve been making plenty of salads, the favorites being panzanella (with bread) and Caprese (with mozzarella and basil). I pull out recipes for tomato tarts. This tangy Tomato Mustard Tart and this retro biscuity Spicy Tomato Pie are tops on the list. I’ve stashed some containers of tomato sauce in the freezer for winter enjoyment. I’ve also become enamored with the roasted cherry tomatoes we made last month. Before the season’s out, one perfect BLT sandwich is a must. 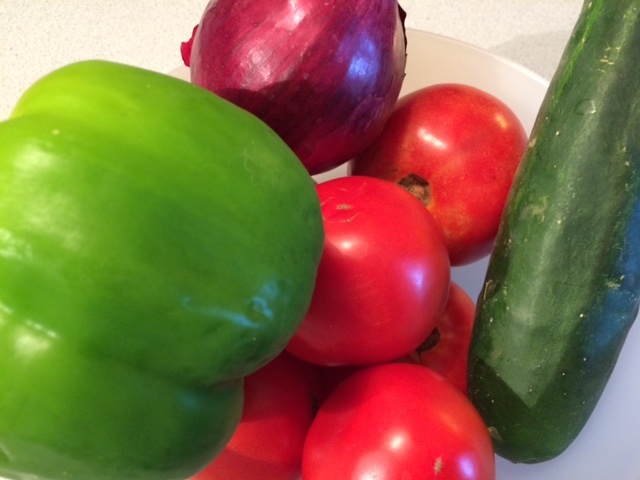 This week’s recipe for Cook the Book Fridays (yes, I know I’m a little late) is Gazpacho. That fits perfectly with my current tomato mania. Early in the season, I make gazpacho with canned tomatoes, but right now, that would be a crime. I started with a trip to the weekly Farmers’ Market to pick up the vegetables. David Lebovitz’s Gazpacho recipe from My Paris Kitchen could also be named “Summer in a Bowl”. Fresh tomatoes are peeled and seeded, then pureed with a slice of bread to add some extra body. The tomato puree is combined with finely chopped cucumber, bell pepper, and red onion along with garlic. A small shot of vodka is added to make the soup taste extra-cold, then chilled before serving. I found the cold soup to be delicious, but not that different from other recipes I’ve made. I know it’s traditional to add the bread slice, but I prefer recipes made without it. 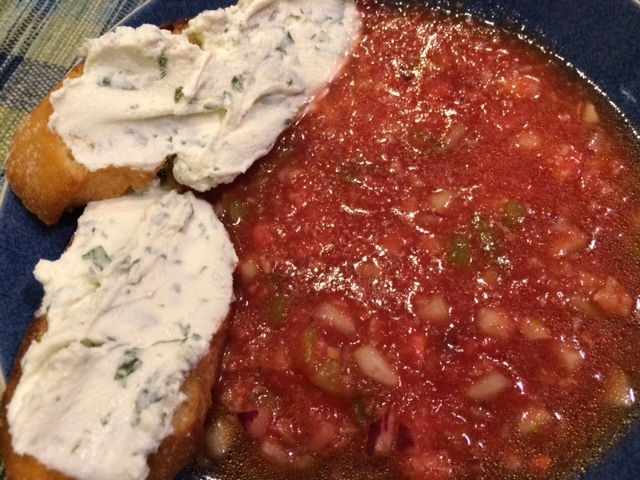 The suggested garnish for this gazpacho is herbed goat cheese toast. Toasted baguette slices are rubbed with garlic and covered with a tangy spread made from goat cheese, olive oil and fresh herbs. I used lemon basil which added a lovely citrus undertone. The cheese toasts turned gazpacho into a light meal for me. And when I ran out of baguette slices, the herby goat cheese was equally delicious on crackers. The goat cheese spread counts as another winner from My Paris Kitchen. If you want to make this yourself, check out the recipe on page 121 of My Paris Kitchen. To see what my blogging friends thought, check out their links here. 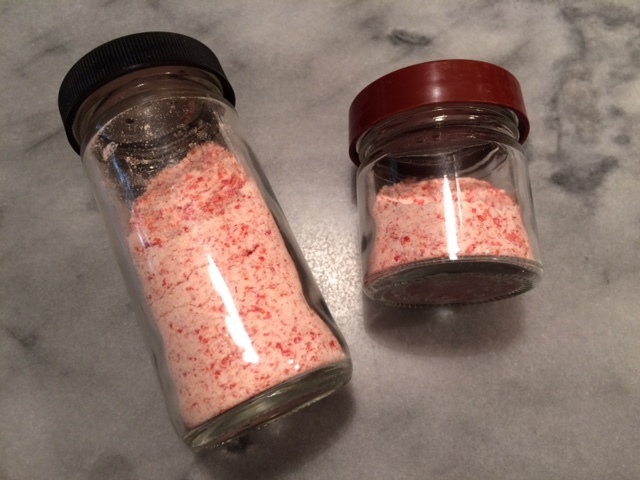 Being a bit over-obsessed about using every last drop of ingredients (when time permits), I used this occasion as an excuse to try out this recipe for Tomato Skin Salt. The skins peeled from the blanched tomatoes are sprinkled with their weight in coarse salt, then dehydrated in the oven to create a seasoning that, judging from the aroma in the jar, will extend summer’s flavors beyond the last frost. Posted on 19 September 2016, in Cook The Book Fridays, my paris kitchen, Soup, tomatoes and tagged Cook The Book Fridays, my paris kitchen, tomatoes. Bookmark the permalink. 8 Comments. Hi Betsy, hope you are well! Your tomato dishes look and sound amazing. Though I’m not prone to jealousy, I admit having such a dismal garden year of tomatoes, that I can’t help myself feeling a little envious knowing it shall be a full year before such delights again make their appearance. Enjoy the spoils! too. I just bookmarked that tomato skin salt recipe, it looks so interesting. You really make the most of the seasons, Betsy. I especially love that you made the tomato skin salt. I composted mine this time, but I always feel bad about it. Where or where did you come up with Tomato Skin Salt. Brilliant. The salt makes your tomato mania complete. You have been an ambitious lady and, just like Teresa, are using everything in your garden. Good for the both of you. I am going to spend some time googling the recipes you linked us to but one may be in your cookbook (I think). David’s version was more salad in a soup than gazpacho but I did enjoy it. Next time I will leave out the bread also and make it a bit more soupy. Lovely post. I have never heard of tomato skin salt. Learn something new everyday. Oh! tomato skin salt sounds wonderful, wish I had known about it earlier… there was a fair bit of skin to test the recipe out! That tomato skin salt looks great!! I wish I had seen that- great idea. I cannot believe all the things you have done with the tomatoes. I think your garden was more bountiful than mine! !